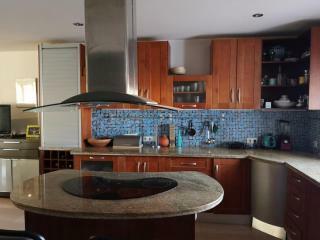 Spectacular Townhouse 512m2 built on two floors with salt water pool, sauna and a 2 bedroom, basement apartment, located in the sought after Barrio San Francisco, views to the Historic Quarter. On the first floor, a light sitting-room with dining area, large French windows out to the terrace overlooking the pool and gardens, chimney, ample, well fitted kitchen including island and breakfast zone, storeroom, cloakroom, patio, terrace with views to the garden, 3 bedrooms, fitted wardrobes, master bedroom en-suite with dressing room, private balconies, bathroom and library. The two bedroom, self-contained basement apartment has an independent entrance. Solar panels and a solarium on the second floor. Central heating. Large, double garage. Low maintenance garden with lawn 300 m2. All building materials, fixtures and fittings of first-class quality. Coast 45 km. Malaga International Airport 100 km. Golf, Equestrian Property, Andalusia. Plot of 200 acres set in foothills of the Sierras de Cadiz, 5 min village Villa Martin with all the amenities. Plot is currently in planning department, approval shortly for ecological 18 hole golf Equestrian. Plot of land in Manilva, orientation south, views of the Mediterranean golf. 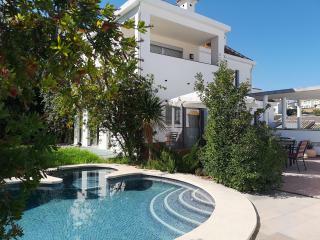 Situated quiet area on Costa del Sol between Gibraltar Marbella with the port of Duquesa closeby. Land classified as urban. Villas Ronda. Modern villa with traditional touch located countryside, only 10 min Ronda. Built to very high standard, 3 beds, fitted wardrobes, 2 baths, master bed terrace views countryside mountains, fitted kitchen, sitting-room, chimney, garage. Holiday Rental. 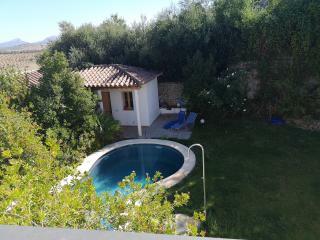 Cortijo 400m2 pool + barbecue Exquisitely furnished, 6 bedrooms, 4 bathrooms, farmhouse kitchen, 2 sitting-rooms, 1 with chimney, delightful gardens. Central Heating, Telephone, Parking for Several Cars. 2 Km. Ronda. 50min Coast. Spanish Farmhouse/Cortijo for sale Ronda. Property 756.50m2 built 220.000m2 land approx. Farmhouse has typical Spanish courtyard is situated in wonderful location with panoramic views of Sierra de Las Nieves Ronda. Bargain - Reduced! Spanish Farmhouse, Andalucia. Farmhouse 200m2 with 47.000m2 land.Totally private, stunning views. Water from own well. Olive Almond trees. Wine producing area. Perfect horses or vineyard. 10 min Olvera and Setenil. 20 min Ronda. Magnificent Cortijo Andaluz/Hotel Rural 1900m2 approx. 12 ensuite bedrooms, museum, wine & olive oil tasting, shop, banqueting facilities, S/C Staff accommodation offices. Splash pool & stables. Within village boundry plot of land 11.000m2 with Orchard, Vines Olives, Genal Valley. Fenced and gated. Good access wonderful views across valley. Right to build 2 houses on part of land. Approx. 15 Km Ronda 35 minutes from Coast. 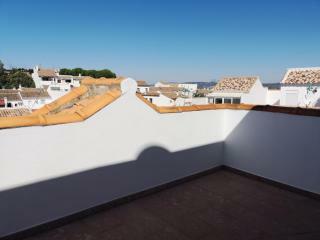 Long Term Rental, Arriate, Ronda. Modern, White village house 100m2 approx. built in traditional style, 3 bedrooms, 2 bathrooms, sitting-room, kitchen/diner 2 patios. Central heating. 7 min from Ronda. 50km Coast. Long Term Rental. 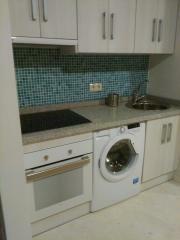 Brand new, modern, furnished apartment centre Ronda. 3 bedrooms, 2 bathrooms, sitting-room, French windows fitted kitchen. Central Heating Double Gazing. 50km Costa del Sol. 100km Malaga Airport. Country house/Cortijo 350m2 built, 16 hectares (160.000m2). 150m2 house, 100m2 barn. Views, pool, olives, stables. Sitting-room, chimney, kitchen, dining-room, 4 beds 2 baths. Cent.Heating. Solar Panels. Good access. Close El Gastor all amenities. Reduced was 2.500.000 Euro! 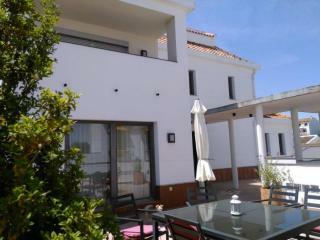 Hotel with Self Catering Apartments, Costa de la Luz, Cadiz, Andalucia. Pool, Gardens, 7 apartments, lush surroundings.10 min. walk beaches. Water Sports. Popular foreign and Spanish tourism. 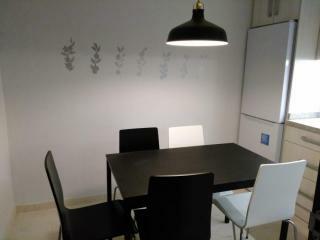 Furnished apartment for rent in the heart of Ronda. Apartment comprises, 1 dble bedroom, bathroom, sitting-room, fitted kitchen/diner Terrace. Flat is situated in the city centre with all amenities on the doorstep. 50km Costa del Sol. 100km Malaga. 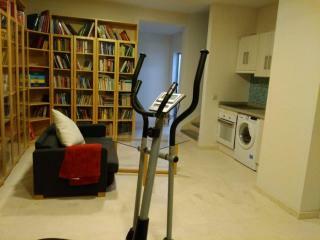 Spacious, 2nd floor Ronda Apartment, 136m2 prime location in centre of city. Views. Comprises 4 bedrooms, master bed en-suite, 2 further modern bathrooms, lovely breakfast-kitchen, fitted units, ample storage. Cent.Heating Lift. Hot water included. Spanish Finca/Country house115000m2 (11.5 h). 15 min from Coast. Amazing views to GaucinSierra de Casares. House with potential to enlarge. Abundant water from own source. Stunning location. Short distance from village all amenities. Reduced was 1.850.000 Eur! Cortijo, pool Guest Houses originally ancient Olive Mill, 165.000m2 land. 8 individual houses total 1500m2 built. Rural Hotel, Equestrian Centre.70km Ronda. 96km Seville Airport. 142km Malaga Airport. 57km Jerez Airport. Large Villa 160m2 open aspect, ideal BB. Views. Comprises 4 beds, 2 baths, sitting-room, dining room, kitchen patio. 2 entrances. Lovely house. Potential for improvement. 34km Ronda. 96km Coast. Investment Property. Hotel for sale Costa de la Luz. 3000m2 built Andalusian style, arched patios. 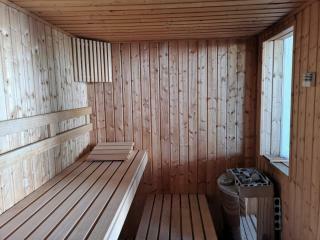 26 en-suite rooms + 3 houses 3 en-suite beds, Cent.Heating/Air Cond. Attractive restaurant indoor outdoor seating areas. Gardens. Reduced! Plot of land 35.000m2 in area of Benalauria with Licence to build cottage. Outstanding views over Genal Valley. Electricity water already connected. Area of outstanding beauty. Village has all amenities. 26km Ronda. Coast 39km approx. 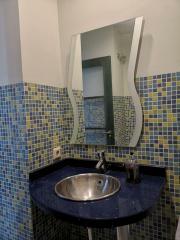 Newly renovated, White Village House 110m2 on pretty square. Outstanding views over Genal Valley. Property comprises sitting-room, chimney, 3 dble bedrooms, bathroom, kitchen terrace. Malaga Airport 131km. Ronda 26k. Coast 39km. Polo Club Riding School, 150000m2 Land. 4 Houses, 16 beds, 6 kitchens, 11 baths, pool barbeque. 40 stables, 2 polo fields, exercise track, storage 6 paddocks. Farm includes 2500 trees. Further details upon application. 20 min Gibraltar Airport. Country House/Finca 200m2, Guest House 500 hectares (1235.526 acres). Views. Comprises 4 beds, 2 baths, sitting-room, chimney, kitchen porch. Completely fenced with access roads throughout. Abundant water, mains elec. Ronda 20 min Coast 35km. Reduced was 169.000 E! Country House 120m2 1.960m2 flat land. Large, open sitting-room, fireplace, 1 huge bed, 2 baths, kitchen garage. Water and electricity. Gated driveway. Mature trees. Good access. 35min Coast. 49km Ronda. 48km Gib. Cortijo/Equestrian 1000000m2 (247 acres). Barn 12 boxes, S/C Cottage, House, Cortijo ruin. Area of outstanding beauty. Panoramic Views. Good access. Water own well. Electricity. Wonderful riding, Via Verde close by. 4 km village. 57km Jerez Airport. Art Gallery Apartment. Separate Escrituras (Deeds). Gallery, exhibition rooms, office, interior patio with fish pool. Apartment available separately 2 beds, bath, sitting-room, kitchen, patio, underfloor heating. Popular tourist base. Ronda 30km. Ruin 112m2, 4 hectares land (9 acres approx) planted Oak trees and Olives. Set in an area of outstanding natural beauty. Exceptional views. Stream. 2 plots totally fenced land. 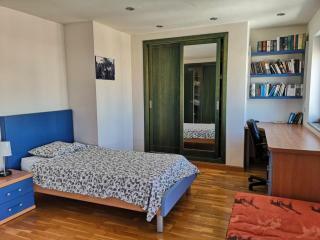 Situated only 1 hr Malaga. 30km Ronda. Country Chalet/Villa, Ronda, . 5 beds, master bed + private terrace views mountains, 3 baths, sitting-room + fireplace, kitchen/diner gymnasium. Large pool, terrace. Cent.Heating, tele. internet. 10 mins Ronda. 100km Malaga. Reduced! Rural Tourism Business with pool, bar restaurant set amidst stunning countryside only few kilometres from historic Ronda. S/C accomm. 4 bed to 1 bed houses fully equipped, parking private terraces. Well presented maintained. Equestrian Cortijo/Rural Hotel 1000m2 built, with Pool and stables with 250.000m2 land and outbuildings. Sold furnished. Beautiful views. 13 beds, 7 baths. Excellent Equestrian facilities. Floodlit arena. 20 min Ronda. Malaga Airport 75km approx. 7 hectares (approx 17 acres) of gently undulating, fertle land. Ideal vineyard or tourism. Panoramic views. Natural water source and electricity connected. Good access. Close to villages San Pablo de Buceite and Gaucin. Gibraltar only 50km approx. Rural Tourism. Cortijo Iznájar Main house with 3 S/C holiday cottages pool. Licensed. Main Cortijo 3 beds. 2, 1 bed houses plus 1 house with 2 beds. Beautiful courtyard. Central Heating. 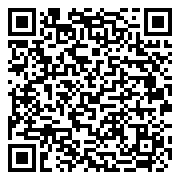 Gas, elec, water, telephone internet. Malaga Airport 90km. Cortijo 800m2, pool, interior patio, 600.000m2 (148 acres approx), guest house, ruin, stables, agricultural buildings and equestrian facilities. 8 dble beds, 8 baths, fireplaces, various recep.rooms. Good access. Ronda 56km Seville 73km. Cortijo 570m2 built, warehouse 400m2 with 37 h (91.4 acres) currently producing fine table olives. Interior patio Andaluz. Large sitting-room, 7 beds, 7 baths, 3 beds en-suite master with sitting-room. Magnificent views open countryside. Good Access. Equestrian property, Montellano. House 200m2, pool views. Land 27.500m2, fenced. 3 beds, sitting-room, fireplace, bath, terrace. Gardens, barbecue. 3 stables, 4 paddocks. Good grazing. Excellent riding. Water, elecsolar panels. 63km Seville. Ideal BB/family home. Country House 200m2. garage, orchard, veg. fields, views. Spacious accommodation. 4 beds, main bed with sitting-room, kitchen/diner, sitting-room, fireplace, store room. Solar panels, own well. Easy access. Gib short drive. Long Term Rental. Townhouse, views famous El Tajo Bridge. Well presented, traditional house magnificent views to gorge. Comprises sitting-room, dining area, kitchen-diner, dble bed , fitted wardrobes, balcony and bath. Min on foot centre Ronda. Long Term Rental. Rural tourism complex with pool offering first-class accommodation. Views Sierra de las Nieves Natural Park. Comprises 2 houses, original features, joined by traditional courtyard. Cent.heating/Air.con. Malaga 75km approx. Rural Hotel/Hostel, pool, patio, roof terrace. Panoramic views. Hotel comprises 8 beds, 8 baths, bar/restaurant, kitchen and toilet. Separate accomm 3 beds, 2 baths, sitting-room/diner and kitchen. Disco, stage, bar ideal functions. Ronda 10 mins. Reduced. Town House/BB, historic quarter. 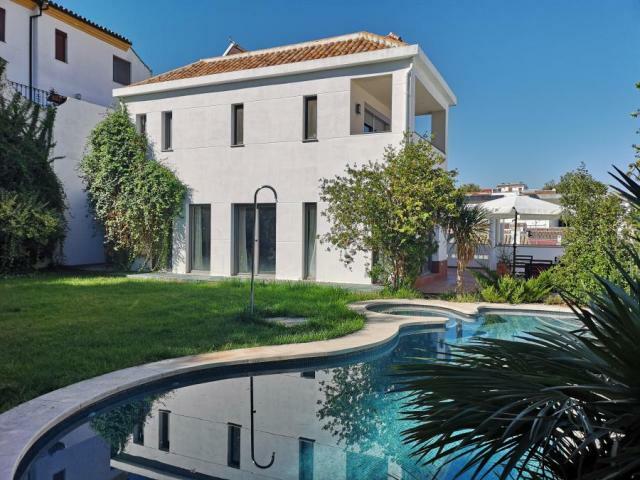 Comprises 7 beds, 3 baths, 2 kitchens, interior patio and roof terrace, views old town and mountains. Formerly 2 properties. Ideal BB, small hotel or private home. 3 min on foot to Bridge. 50km Coast. Long Term Rental. Furnished apartment. A well presented, modern apartment comprising one double bedroom with fitted wardrobes, kitchen, sitting-room-diner and bathroom with small balcony overlooking the square. 50km Coast. 100km Malaga Airport. Grazalema, Finca, 350m2 built, outbuildings, views. Currently 2 beds, bath, sitting-room-diner, kitchen, original Features, wooden ceilings. Poss further accom. Good access. Electricity, 2 wells and natural water source. 10 min village. Ronda 34km. Chalet 350m2 built in plot 8000m2, superb pool with spa. Comprises kitchen-diner, office, 4 beds, 2 baths, master bed terrace, roof terrace, covered porch. Immaculate garden, fruit trees. Cent.Heating. Ronda 10 min. Malaga Airport 100 km. Coast 50km. Cortijo, Cottage, Barns and Ruin. 140 ha (345 Acres approx). Comprises 5 beds, 4 baths, partially renovated, main works completed. Cork Farm in production providing good income. Magnificent views. Abundant water. Gibraltar 47km. Equestrian Centre, 12 Boxes, 2 Houses, Pool, 4 ha. Equestrian business, 12 boxes, 4 ha. 2 houses, pool, 5 beds, 2 baths, only 5 minutes from Jerez Airport. Excellent installations including floodlit training arena, tack room, feed-store, grass paddocks. Fully fenced. Good access. Water Elec. Andalucian Farmhouse for renovation with sea views, 350m2 built, 34 acres with outbuildings. The Finca is Ideal large private home, potential rural Hotel, retreat or equestrian. Close to Estepona and Marbella. Good access. Abundant water. Investment Opportunity. Country Estate, 20.000m2. Studio, workshop, pool, outhouses, mature gardens. Recently refurbished. Workshop, studio designed for conversion to separate house, possibility two dwellings. Marbella 20 min. Malaga Airport 70km. Andalucian Cortijo, Estate 107 ha approx, pool, outbuildings. Magnificent views, 3 ha mature gardens. Property offers complete privacy. Finished to very high standard with range of uses incl. Private Estate, Hotel, Event Centre. 15 min Ronda. Finca renovation, old Spanish Cortijo 350m2, outbuildings, 60 has, 600, 000m2 (148 acres approx). Stunning scenery. Planted olives with grazing and cultivation land. Stunning scenery. Permission to move location of finca. Elec water. 24km Ronda. Country house 350m2, open-plan interior, plot 12000m2, garage, views mountains, countryside. Comprises sitting-room, wood-burning stove, big French windows, kitchen, 2 dble beds, 2 baths, quality fittings. Good access. Close all amenities. 8km Ronda. Ideal Guest House/large family home, 300m2 built including Apartment - 6 beds, 5 baths, pool, garden, barbecue, covered porch garage. 2 accommodations. Apartment 2 beds, sitting-room chimney. Garden not overlooked. 50km Coast. Malaga Airport 100km. Country house 160m2, 4 stables, pool, orchard, mature gardens. Plot 7.400m2. 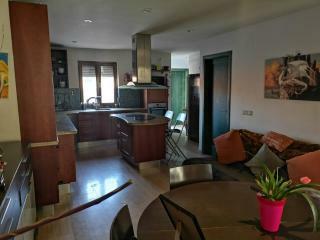 Sitting-room-diner, kitchen-diner, 3 beds, master en-suite, terrace, family bath. Summer house, kitchen, covered porch. Well, mains water, elec. Good access. 10 min Ronda. Apartment historic Ronda. Attractive flat within traditional Spanish Townhouse. 1 double bedroom, large fitted wardrobe, bathroom, sitting-room kitchen. Close to all amenities. Super area. Approx 10 min walk from centre of city. 50km Coast. Stone Ruin renovation 100 m2 approx. plot 13.000m2. Mainly flat land, views. Good access. Water, electricity close by. Nearest white villages Algatocin and Gaucin for all amenities. Malaga International Airport 131 km. Coast 38 km. Large plot 380.000m2 (38 hectares) containing cork trees and building 160m2 approx situated close to white village of Atajate. Wonderful views, very good access and less than 5 minutes from the village. Ronda 15 km. Coast only 45km approx. Country house 297m2 built in plot 1.215m2. Property includes interesting features, original chimney, beams cobbled courtyard. Stunning mountain location with beautiful views. Water Elec. Only 2 km from village. Ronda 35 km. 38km Coast approx. Commercial Unit 400m2, central Ronda. Ideal gym, dental clinic or beauty salon. Good cond. comprising reception, tiled floor, half-tiled walls, bar, 3 toilets, stage. Room for lift. 2 Entrances. Sound proofed. Former music venue. Cent.Heat/Air Con. Finca with 44 hectares (108 acres approx) land containing 3 ancient ruins included in Deeds. Located in the area of Faraján and Alpandeire. Spectacular views. Ronda 25km. Malaga International Airport 112km. Coast 51km approx. Finca for sale in beautiful Genal Valley, 25 Ha and and old ruin for restoration approx 100m2. Beautiful views. Orange grove, walnuts, almonds and cultivation land. Own water from well with free irrigation water. Oaks, Pines. Ronda 43km. 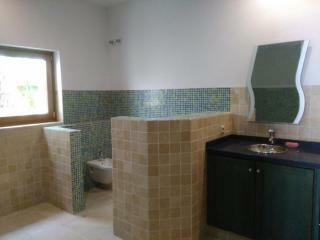 Renovated village house 165m2, mountain village of Grazalema. Spacious property comprising tiled entrance, sitting-room, chimney, kitchen-diner, 4 large dble beds, master en-suite, family bath, patio. Ronda 28km. Malaga International Airport 127km. Reduced! 7 min Ronda. Finca 200m2 for renovation, outbuildings 41.770m2 mainly flat land, olives suitable cultivation. Stunning location. Good access. Water own well. Elec. connected. 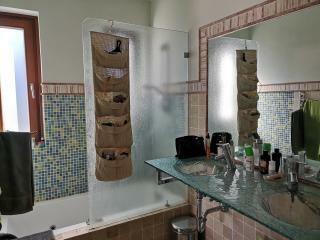 Ronda for all amenities. Coast 50km. Malaga Airport 100km approx. Renovated farmhouse, residential and commercial potential. 2 dwellings. Main House 6 beds, 4 baths, 2 reception rooms, chimneys, kitchen, pool. S/C Annexe 2 beds, mezzanine. Summer kitchen. Wonderful hiking Malaga 137km. Sotogrande 30 min approx. Villa for sale Arriate. Available Rent Option to Buy. Villa 115m2 sitting-room + chimney, fitted kitchen, 3 beds, 2 baths, terraces 80m2 huge garage 100m2. Pre.int. cent.heat. air con. solar panels alarm. Comm. Pool, paddle tennis. 10min Ronda. 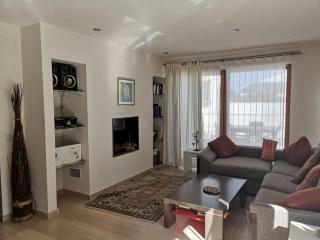 Townhouse, 200m2 with 4 beds, main bed en-suite, family bathroom, fitted kitchen, cloakroom, sitting-room with fireplace, central heating, huge garage 80m2. Roof terrace views to city walls. 10min centre Ronda. 45km Coast. Long Term Rental. Character cottage renovated to high standard, pool, pool house with kitchen and Bbq. 4 beds, 3 baths, sitting-room-diner, well equipped kitchen, laundry room. Mosquito screens. Covered parking. Malaga airport 100km. 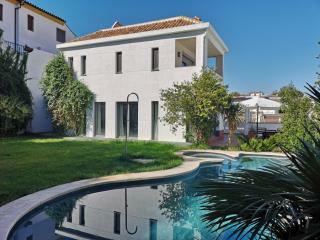 Modern house 66m2 traditional Spanish style, located on small urbanization close to village of Montejaque. Comprises sitting-room with dining area, log-burner, open-plan, fitted kitchen, 2 dble beds, bath, patio overlooking gardens. Ronda 20 mins. 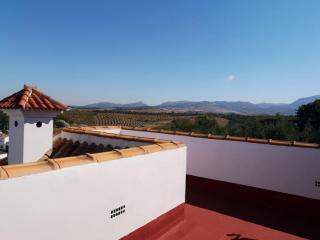 Country house on one level, 170m2, with S/C 1 bed Apartment, Ronda 2.5km, pool, views. Sitting-room-diner, chimney, kitchen-diner, 3 beds, master en-suite, bath, wooden beamed ceilings, terracotta tiles. Air con/heating units. Good access. Cortijo/Country House, Equestrian Finca, 30 Has. Historic quarter renovated townhouse 70m2, terrace 9m2, views. Furnished. Comprises entrance, 2 beds, bath, kitchen and sitting-room. In perfect order, exquisitely decorated. Mins to centre Ronda. Rental potential. 50 km Coast. 100km Malaga Airport. Country house, pool land 15.000m2. Olives. Panoramic views. Sitting-room, wood burning stove, kitchen, pantry/storeroom, 2 dble beds, bath terrace 90m2. Mains elec own well. Garage parking. Good country road 1km from main. Zahara 9km. Country cottage/finca for sale with Land 133.000m2. Oak Cork trees. Beautiful views over open countryside to village. Mains water. Electricity close/solar panels. Fairly good access. 20km Ronda. Coast 50km. 2 mins from village. Country House, pool in plot 3.200m2 planted olives. Main house 2 beds, bath, sitting-room-diner, American Kitchen, covered porch. Plus 1 bed cottage. Pretty views. Ronda 20 mins. Commercial Unit 233m2 in a well situated location. Comprises ground floor storage, bathroom and loading bay. Light property. Costa del Sol 48km. 100km Malaga Int. Airport. 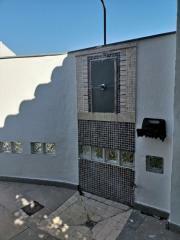 Townhouse 96m2, 4 beds, 2 baths, recently renovated. Views to village, valley, Serrania mountains. Comprises sitting-room, feature fireplace, fitted kitchen, terrace, storage room, patio. New wiring, plumbing, floors, doors. Cent.heating. Coast 61km. Tourism Business - Equestrian Ranch with separate guest and owner houses. Fantastic views. Comprises 2 houses, pool, 60.000m2 (approx 14 acres) land. Guest accomm for 7/8. Stable block, fenced sand school, lunging ring. Fantastic riding area. New Price - Village House 180m2, thickwalls, patio, views. Currently 3 beds, 2 baths, possibility for additional beds, sitting-room and kitchen. Ideal Bed and Breakfast or beautiful family home. Ronda only 15km. Malaga Int. Airport 125km. Genal Valley, Finca, Guest House, 11 Ha. Ruin 139m2 with land 85.000m2 flat gently sloping land planted Olives. Amazing views. Located between Montellano and Seville. Abundant water own well. Electricity nearby. Ideal Equestrian use or beautiful, private country home. Good Access. Country House 250m2 built, pool, garage, storeroom, orchard. Quiet location. Posibility to extend. Currently 2 beds, 2 baths, sitting-room-diner, chimeny. Fenced plot. Olive, fruit trees. 3km Ronda. 98km Malaga International Airport. 60km Coast. Equestrian Centre, professional facilities. Boxes, large outdoor riding arena, horse-walker, lunging ring, hay storage barn, tack-room, outbuildings, paddocks and grazing for 80 horses. Incudes club room. Project to build country house. Ex.Fish-Breeding Farm 662m2 built, ideal rural Hotel/Spa, water from one of most prestigious springs in the Sierra de Cadiz, or re-established for fish-farming. Ground floor houses equipment lab. First floor large apartment offices. New Price: Cortijo, pool, 24 acres, outstanding views to Sierra de Grazalema. Stunning Cortijo 170m2, 2 reception rooms, stone wall features, open-plan kitchen-diner, 4 beds, 2 baths. Light and airy. Cent.Heat. 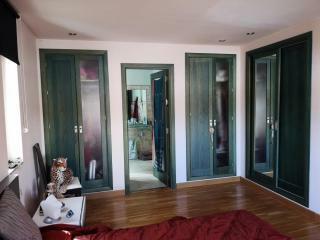 Dble Glazing. Good Access. Int Sat Tv. 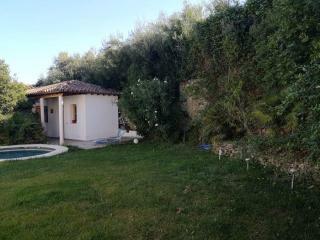 Villa 350m2, plot 2.500m2, pool, guest accomodation. 5 beds, master 60m2, 4 baths, sitting-room, fireplace, dining room, quality German kitchen. Fruit trees. 2 entrances. Cent.Heat/Air Con. Quiet area ideal Bb or family home. Ronda 5 min. 60km coast. Long Term Rental. Country Cottage. 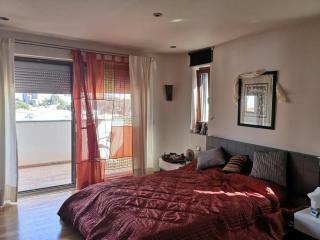 Well presented, 2 dble bedrooms, bathroom with hydro-massage shower, sitting-room, Tv, kitchen and garden. No dogs. Owner would permit horse. Use shared pool. Ronda only 2km. 55km Coast. 109 Malaga Airport. Offer - Country house 100m2, pool and garage plus 3.500m2 land. Views to Lake. Comprises sitting-room, chimney, 3 beds, bath and fitted kitchen. Wooden beams and mantels. Covered porch. Land fenced with entrance gate. Country House/Finca, pool, in plot 4500 m2, planted olives fruit. Comprises 3 dble beds, bath, sitting-room, chimney, kitchen, covered porch, views across olive groves. Walled entrance. Elec, water mains plus private well. Malaga Airport 100km. Country house with 35.000m2 land planted with olives in production. Amazing views. New house comprising 2 beds, bath, sitting-room, feature chimney and kitchen. Solar panels, own well 110 m deep. Good access. 5 min Olvera. River 1 km. Reduced! Country house 300m2, in plot 5.300m, pool, views, office/guest house. 8km centre Marbella, 4km beach. Sitting-room/diner, kitchen, utility, 3 beds, 2 baths, cloakroom, wooden floors. Fruit trees. Porch, dble garage. Golf 3km. Good Access. Long Term Rental. 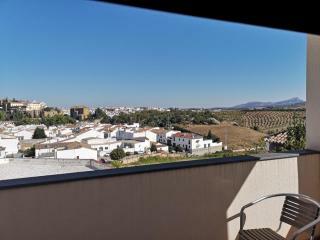 Furnished, 2nd floor apartment, heart of Ronda. Stunning views from roof terrace over city and famous bridge. 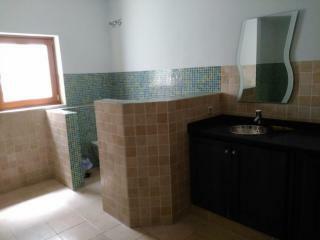 The property comprises sitting-room-diner, kitchen-diner, 3 beds and bath. Interesting features. 50km Coast.